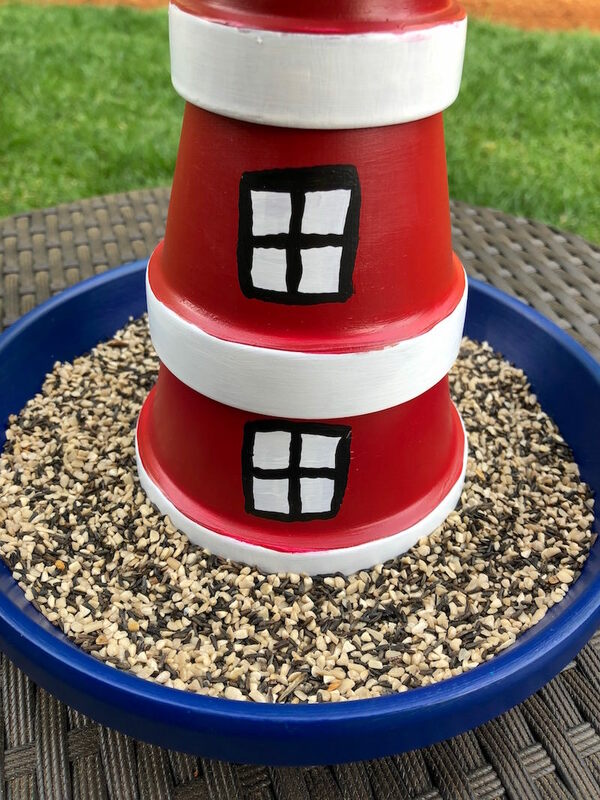 Learn how to make a lighthouse bird feeder using terra cotta pots! This DIY bird feeder is so easy that even kids can make it. 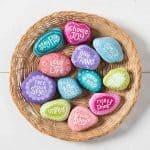 So fun for spring and summer. Don't forget to scroll down to see a video of this process at the bottom of the post. Skills Required: Beginner. This DIY bird feeder just requires painting and then gluing together. Painting the windows are your only somewhat challenging portion of the project, and I'll give you some tips and tricks below. I have to admit that I am *somewhat* new to using terra cotta pots as a crafting surface. 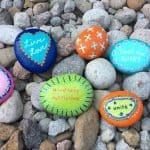 If you look around this blog, I've done flower pot decorations with Mod Podge, then I've also used the pot trays for a DIY bean bag toss. So I've done a few things with terra cotta pots, but it's all been relatively simple. 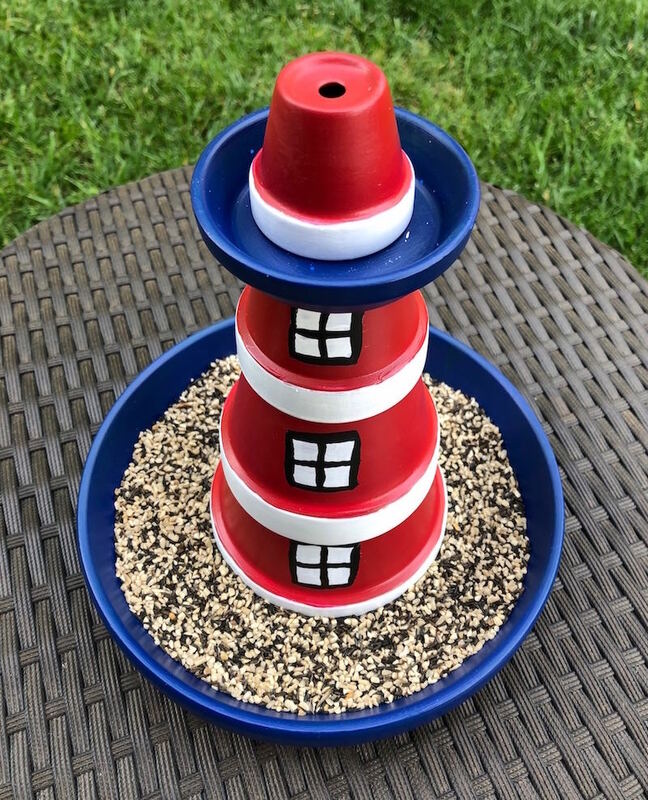 There's so much more that you can do with them – and this lighthouse bird feeder is a great example of the versatility! 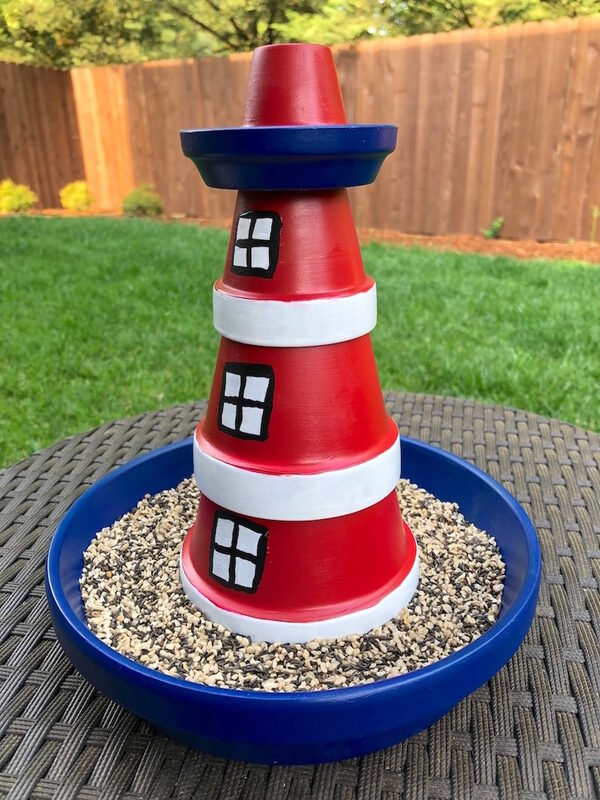 The whole reason I tackled this lighthouse bird feeder project was as a Facebook Live for Michaels Stores, and I had a blast doing it (scroll to the bottom of the post to see the Live!). I knew I had to post a tutorial and share the fun with the world. Before we dig into the tutorial, I wanted to share a few tips with you so that you can achieve success with your DIY bird feeder. These are good tips for crafting with pots in general. To repurpose a used clay pot, be sure to thoroughly clean it first before sealing and decorating. Thoroughly remove dirt and salt residue; if needed, scrub the surface with a wire brush. Once clean of dirt and debris, soak the flower pot in a solution of 9 parts water to 1 part bleach for 24 hours in order to kill any lingering bacteria. After soaking, thoroughly rinse the pot with clean water and allow it to dry completely. Follow by sealing your terra cotta pot before decorating. If it rains a lot where you are at, or you plan to leave it out on something besides a covered porch, you might want to consider drilling drainage holes in the largest saucer that is the base of your DIY bird feeder. There will be a hole in the center of the largest saucer, but that gets covered up when you glue the lighthouse portion over the top. This article will teach you how to drill drainage holes, and the key is using the right drill bit. 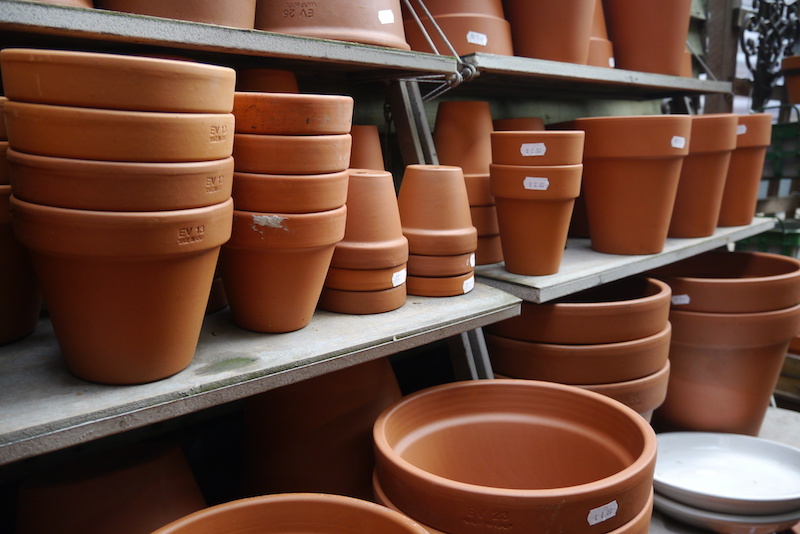 For these types of unglazed terra cotta pots, you would use a masonry drill bit. I've done it before and you need to work slowly. Stephanie's article that I linked to has several other tips as well. 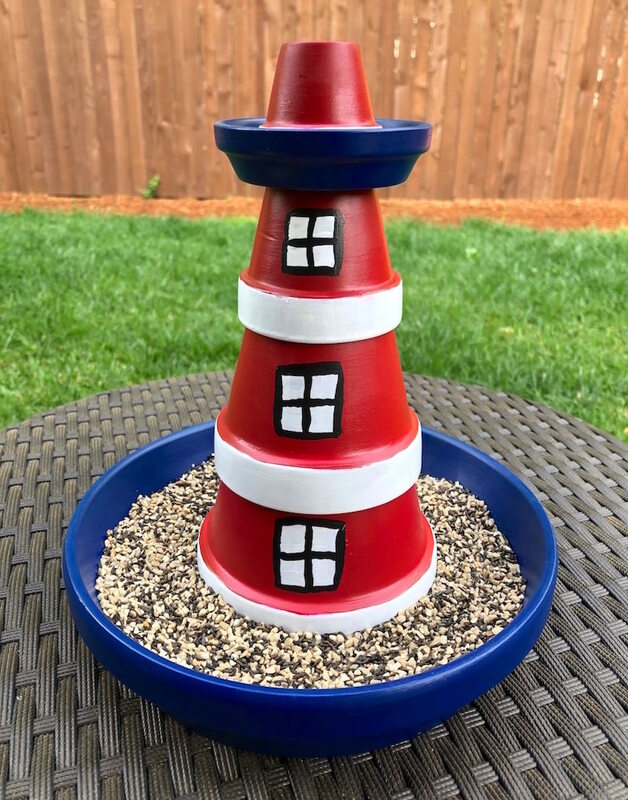 If you find that drilling is not something you want to do, just remember to bring in your lighthouse bird feeder when it's going to rain, or leave it under a covered portion of your porch. The birds will still fly in and grab seed! During the Facebook Live I got several questions on how to hang this lighthouse bird feeder. I designed this for a tabletop, but you can hang it if you choose. You'll definitely want to make sure that you use a very strong glue like E-6000 so that nothing falls apart. You'll place an assembly system in the very top pot BEFORE you glue it down – the wire to hang should come out the top of that smallest pot. 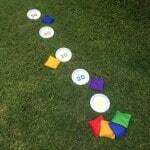 You're going to use a tutorial like this one to help you. You can use wire and an eye bolt, and you don't have to attach the eye bolt to anything, as long as it's large enough so that it doesn't slip through the hole. My one warning to you is that I wouldn't hang your lighthouse bird feeder if you get a lot of wind. This isn't a huge DIY bird feeder, but it's not small either, and if you have too much wind it's going to blow all over the place and spill all the seed. Are you ready to jump into the tutorial?? Keep reading!! 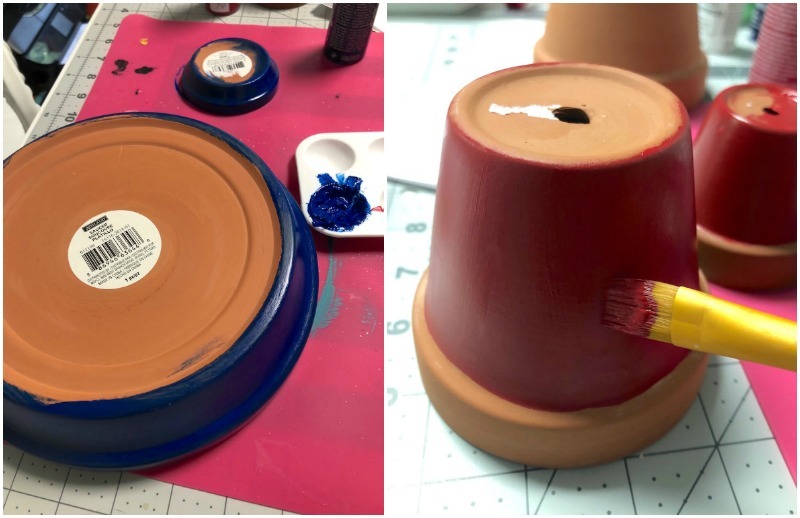 Paint your clay pots with multi surface paint. Paint the two trays with blue and the bases of the pots with red. Let everything dry – it will take a few coats to cover them fully. Once your pots are dry, use a smaller brush to paint the edges of the pots with white. 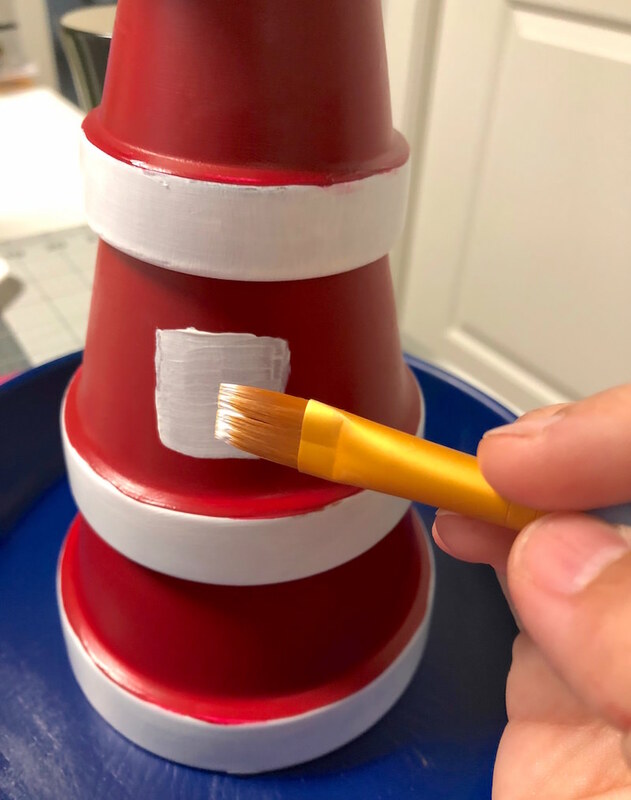 If you end up painting over the edge onto the red a little bit, either wipe it off or let dry and then paint red over the top. Let all of your pots dry. Use the E-6000 to glue the largest pot in the center of the largest clay pot tray. Place a bead of E-6000 around the top edge of the pot and place top down into the center of the tray; let dry. E-6000 glue is waterproof and will hold up well to the elements. Place a bead of E-6000 around the inner edge of the next largest pot. Stack it onto the base of the largest pot and let dry. Repeat with a third pot and let dry. Then glue the small clay pot tray onto the top of the structure. 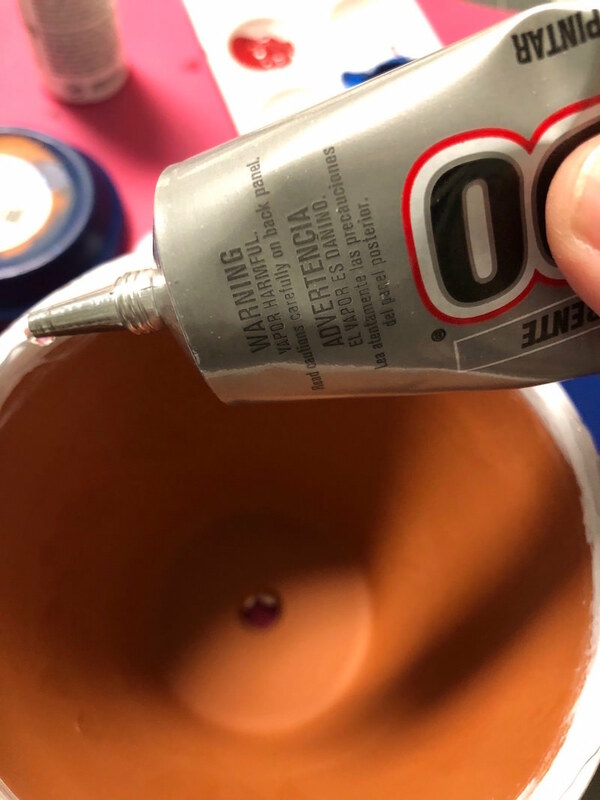 Glue the smallest clay pot as you did the others, on top of the clay pot tray. Your lighthouse bird feeder has come to life! It was at this point that I decided to paint the window squares on my lighthouse bird feeder. Why did I wait? Because when I stacked and glued the pots, then I could clearly see how much overlap there would be and where the windows should go. 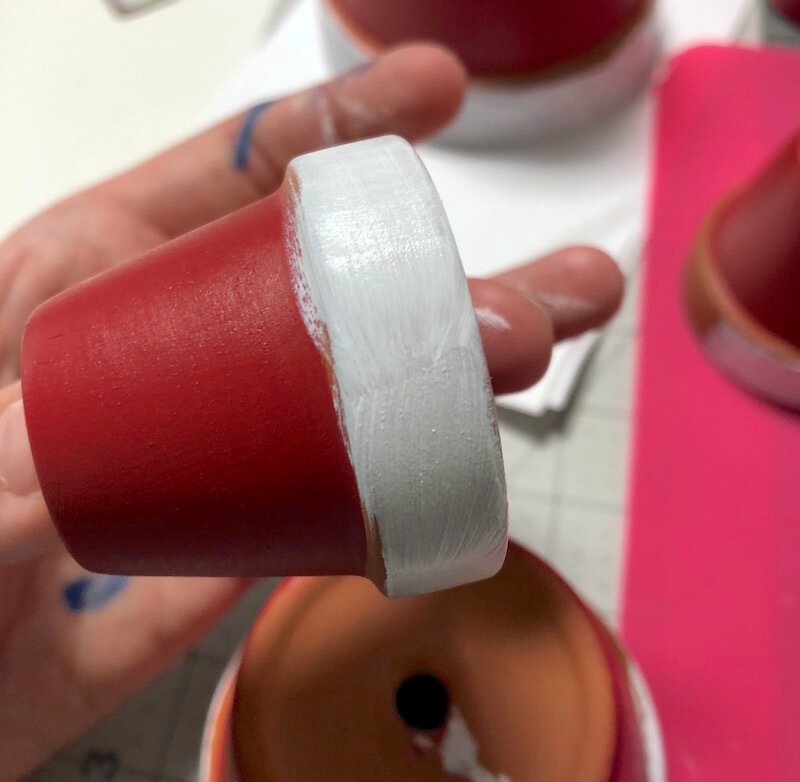 You can paint the windows before you stack and glue the pots, but just make sure they don't overlap too much! You have two options for finishing the windows on your DIY bird feeder. I've got a shaky hand, but I was able to use a small detail brush and some acrylic black paint to paint some lines that look reasonable. I stabilized the bird feeder on my table top and just held tight and went for it! You can draw pencil lines to help you – across the white paint. This will give you a bit of a guide. And guess what? If it doesn't look perfect . . . you're fine. No one is going to be able to tell. Another option is to use a Sharpie. The paint must be completely dry before you use the Sharpie on top or you're going to have smearing. Some find that oil based Sharpies (the paint markers) work better for them then regular Sharpies. I would tend to agree with this. So if you find that you draw better with a marker that you can hold in your hand, use the oil based paint markers for success! 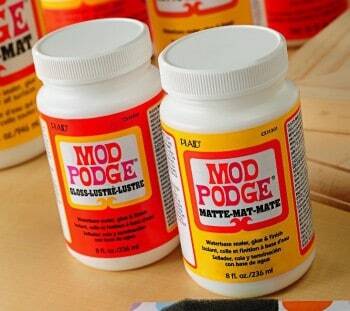 Let your DIY bird feeder dry fully and seal with Outdoor Mod Podge if desired. 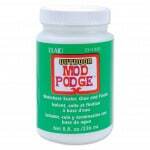 The Outdoor Mod Podge will slow any potential wear and tear from sun and other elements. 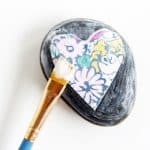 10 Easy Painted Rocks That Are Fun to Make – Plus Tips! The lighthouse bird feeder is very cute. Where did you place it? Won’t the rain ruin the bird seed when it gets wet?